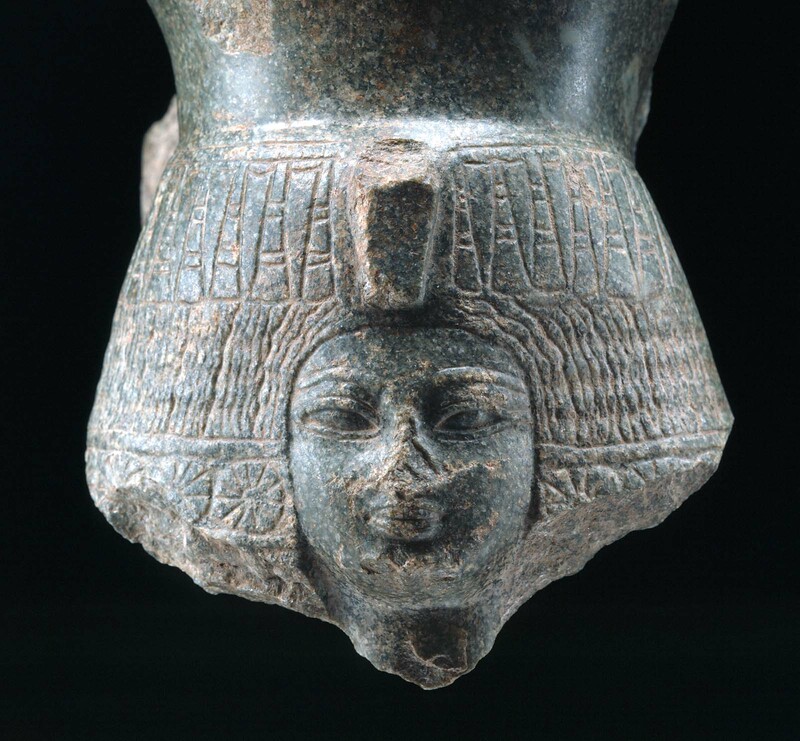 By the second year of his reign, Amenhotep III was married to his “great royal wife,” Queen Tiye. We know more about Tiye than we do about any other Eighteenth-Dynasty queen with the exception of Hatshepsut who ruled as pharaoh. The names of Tiye’s parents, both commoners, were proclaimed far and wide on a series of large commemorative scarabs and circulated throughout the empire - an unheard-of practice. No previous queen figured so prominently in her husband’s lifetime. 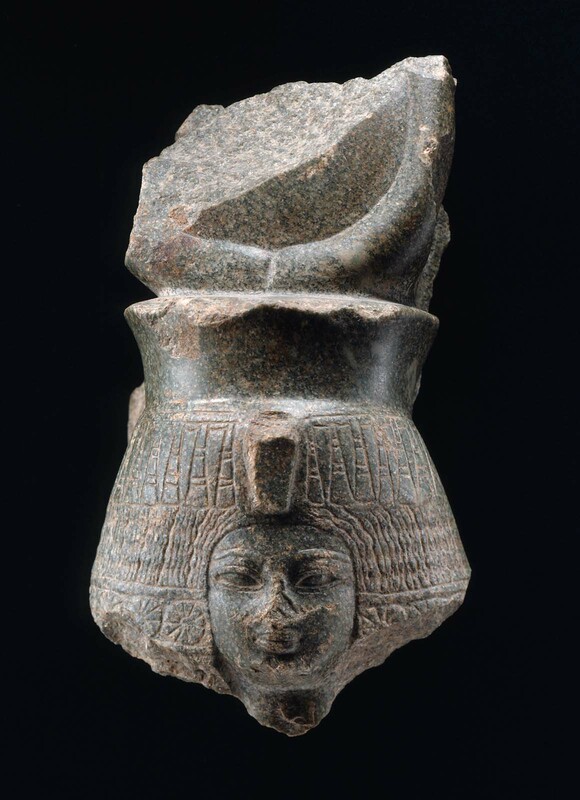 Just as many images of Amenhotep III show him as a god, this head of Queen Tiye shows her as a goddess. The attributes of the goddess Hathor - cow horns and sun disks - on her headdress emphasize her role as the king’s divine, as well as earthly, partner. She even has the king’s facial features. In contrast, the large enveloping wig, encircled by a floral wreath and a band of rosettes, is not a conventional goddess’s hairdo but that of a contemporary lady of fashion. The combination of divine and queenly attributes intentionally blurs the lines between deity and mortal ruler. The head was acquired in the Sudan and is carved of Sudanese stone. It very likely comes from Amenhotep III’s temple to his queen at Sedeinga in northern Sudan, where Tiye was worshipped as a form of Hathor. Her memory survives there today in the name of the neighboring village, which is locally known as Adey, from Hut Tiye, “the mansion of Tiye.” The temple at Sedeinga was the pendant to Amenhotep III’s own, larger temple at Soleb, about 14.5 kilometers (9 miles) to the south. Indeed, the emphasis on the queen’s role as the king’s divine female counterpart provided the model for Nefertiti in the reign of Amenhotep IV (Akhenaten) and anticipated the divine queens of the Ptolemaic Dynasty. 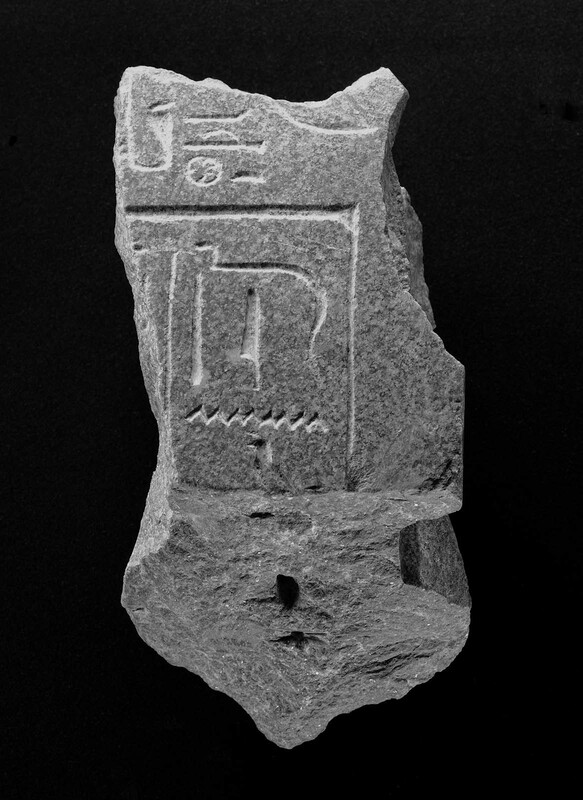 From Dongola Province, Sudan (probably from Sedeinga). 1921: given to George Reisner for the MFA by Jackson Pasha.